Cancellation of an interline and frequent flyer tie-up between American Airlines and JetBlue is a direct result of the American and US Airways merger and the new combined airline’s improved positioning on the US east coast driven by the Philadelphia hub at legacy US Airways. A product of the integration under way between US Airways and American, the new American’s hub in Philadelphia was simply too close to both Boston and JFK airports covered by the relationship between American and JetBlue. While the termination of the agreement between American and JetBlue is a small development in the complex integration occurring between US Airways and American, it is another by product of the changing dynamics that consolidation is ushering into the aviation business landscape. American and JetBlue struck a partnership agreement in 2010 to interline on certain American long-haul flights from JFK and Boston and JetBlue’s domestic routes from those two airports. The two airlines later entered into a frequent flyer reciprocity arrangement. At the time it was a smart move for American, which had pulled down Boston during the last decade while JetBlue saw an opportunity to build up share at the airport. 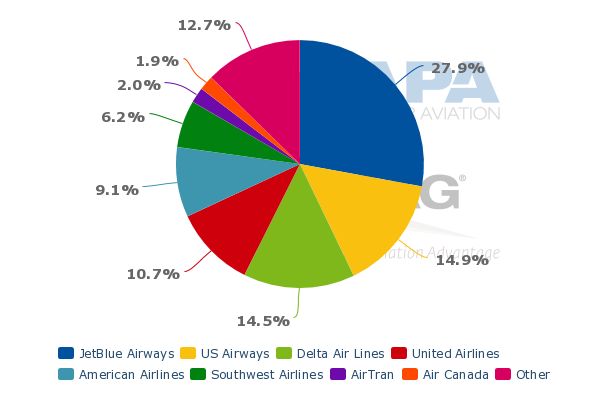 Presently, JetBlue holds a 28% seat share at Boston Logan (according to CAPA and OAG data for the week of 10-Mar-2014 to 16-Mar-2014), and offers more than 100 daily departures from the airport. JetBlue has previously declared its intent to reach 150 daily departures from Boston. US Airways is the second largest carrier at the airport measured by seats deployed, with a 15% share. US Airways’ larger presence at Boston versus American (which has a 9% seat share), coupled with its commanding position at Philadelphia, (which is 243nm south of Boston) makes the American-JetBlue relationship redundant. Cities covered under the interline/frequent flyer deal from Boston where American passengers could connect through JetBlue flights, include Buffalo, Baltimore/Washington, Denver, Fort Myers, Jacksonville, Newark, Orlando, Phoenix, Pittsburgh, Washington Dulles, Richmond, San Francisco and Washington National. Based on data from CAPA and OAG, US Airways currently offers flights from Boston to Buffalo, and its hubs in Phoenix and Philadelphia, Richmond and Washington National. Of the 16 destinations covered under the interline agreement from Boston, US Airways serves 14 from its Philadelphia hub. Of the 17 routes covered under the arrangement from JFK, US Airways offers service to 14 of those markets from its Philadelphia hub, which is 81nm from JFK. American’s long-haul flights available to JetBlue’s passengers include service from JFK to Barcelona, Buenos Aires, London, Madrid, Manchester, Milan, Paris, Rio de Janeiro, Rome, Sao Paulo and Tokyo Narita and Haneda. For its part JetBlue seems unfazed by American’s decision to end the interline deal. JetBlue CEO Dave Barger recently told investors that the ending of the relationship was not surprising considering the US Airways integration. Mr Barger remarked that JetBlue recorded about USD120 million in incremental revenue from partnerships in 2013, up from USD80 million in 2012. The exact value of the interline deal with American is not known, but it was likely small given JetBlue’s fairly large partner base that comprises nearly 28 carriers. It also has several one-way codesharing arrangements and is migrating to some two-way deals with certain carriers. Its partners in two-way codesharing agreements include Gulf carriers Emirates and Etihad. Codesharing tends to generate a greater amount of revenue, so the ending of American’s deal is not likely a huge blow to JetBlue, who will continue building up its partnership roster. One partner that may factor significantly in JetBlue’s future is Emirates, which launched service from Dubai to JetBlue’s Boston stronghold in Mar-2014 on the same day JetBlue introduced service from Boston to Detroit. Mr Barger remarked those service launches were not a coincidence given Detroit’s sizeable population with ties to the Middle East. At the time Emirates launched its Boston service carrier president Tim Clark observed to media outlets that the airline could place an Airbus A380 on the service within a year given the airline’s bullish outlook on forward bookings. Presently, Emirates operates daily service on the route with 266-seat Boeing 777-200LR widebodies. The carrier has two configurations on its A380s – 489-seats and 497-seats. Replacing the 777-200LR with an A380 Emirates would nearly double its daily seat offering to Boston. If Emirates bolsters its capacity to Boston, JetBlue would recognise some benefit from the expansion, and with the two-way codeshare between the two carriers, at least some bump in revenue. 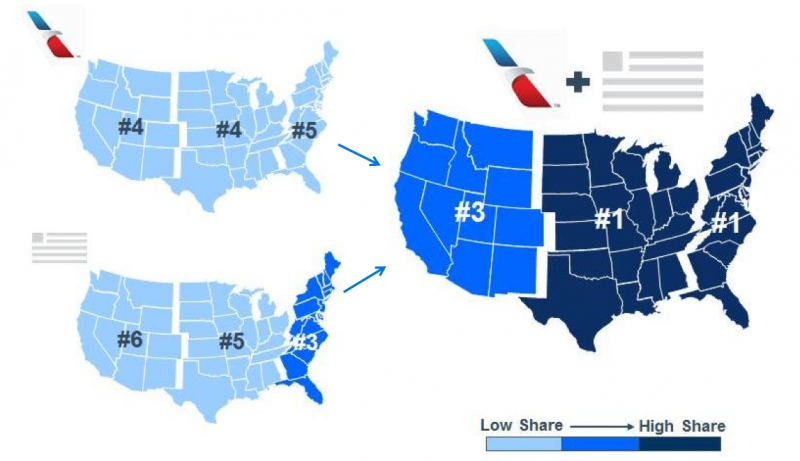 American now reasons that it is number one on the US east coast in terms of network share combined with a ranking of fifth place for American pre-merger and US Airways’ third place ranking. Much of the strength of the “new” American’s east coast network lies in US Airways’ commanding presence in Philadelphia along with its shuttle markets among Boston, New York and Washington, DC. As the integration and full combining of the US Airways/American networks continue, the routes included in the JetBlue partnership are essentially redundant, and likely offer little value to the merged carrier. The ending of the JetBlue partnership is a by product of consolidation in the US industry that results in American, Delta and United focussing on maximising connectivity and revenue at their respective hubs. In its simplest terms, the JetBlue-American partnership in Boston and JFK made little sense given the connecting power US Airways enjoys in Philadelphia. Given JetBlue’s marketability from its JFK headquarters and largest base and its prominence in Boston, it is hard to believe the airline will face challenges in attracting new partners to replace the American partnership. And American ensures it is not spilling revenue from its Philadelphia hub, which should emerge in the combined network as a key airport to serve secondary, but profitable, long-haul destinations. While ultimately inconsequential in the overall evolution of the US aviation industry, American’s decision to sever ties with JetBlue does reflect the changing dynamics of partnerships, and the tenuous nature of those tie-ups.